A ticket gets you a poker hand. You can play as many hands as you want and have as many people in your car as you want. We all start at the same location and are given a list of clues to other check points around town. When you arrive at a check point you collect a card. Everyone meets at the finish line location for a set time where you will enter your hand(s). Who ever has the highest poker hand wins a 60" TV donated by Samsung & The Power Centre. There will also be other prizes and give-aways. Each participating car club must provide volunteers to man one of the secret check points - volunteers can still play a poker hand(s) to win. If anyone is interested in being one of the volunteers please post in this thread. Pledge sheets are available right now if anyone is interested in starting to collect donations. You can also get in touch with me if you would like to sell tickets. Remember, all the money goes directly to help sick children! If you collect over $30 in donations you will receive one free ticket(hand). Tickets are currently on sale. If you would like a pledge sheet or a ticket, please PM me or post in this thread and I will arrange to meet with you. 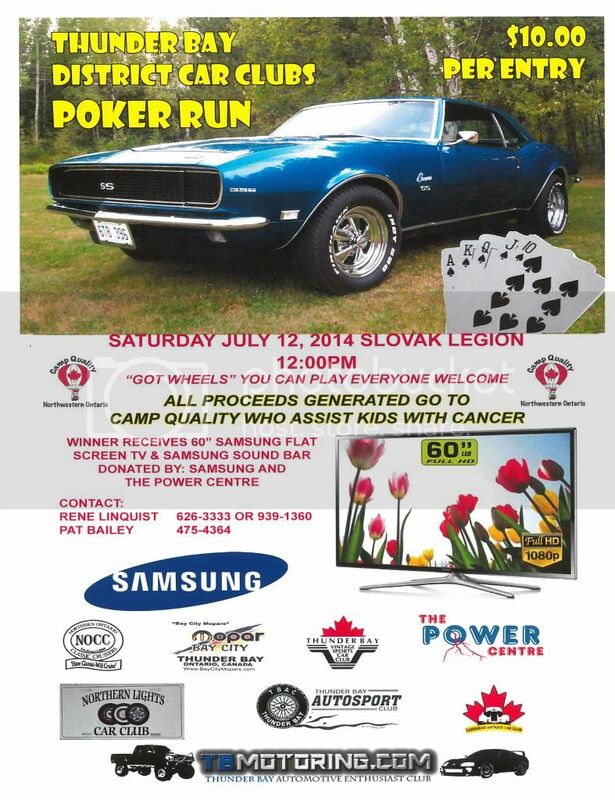 Let's show our support and make this a great charity car event for Thunder Bay. This is a great opportunity to enjoy the summer and take a cruise in your vehicle by yourself or with friends. Please don't be shy to start collecting pledges, let's out do last year's event and raise as much money as we can for the kids at Camp Quality! What are the 7 car clubs? Northern Ontario Classic Cruisers, Bay City Mopars, Thunder Bay Vintage Sports Car Club, Northern Lights Car Club, Thunder Bay Autosport Club, Lakehead Antique Car Club and TBMOTORING. If you need a ticket or a pledge form, I can drop one off to you. Same goes for anyone else, just post in here or PM me. pretty sure everyone on this site should show up. and if they don't I guess its cause they don't want to help kids with cancer? There is a meet this Sunday. I'll bring some. I'll have tickets available at the next meet so bring $10 and get a hand. This Sunday will be the last day I'll have tickets available. I'll also be accepting pledges in case anyone cannot attend but would like to donate to Camp Quality.